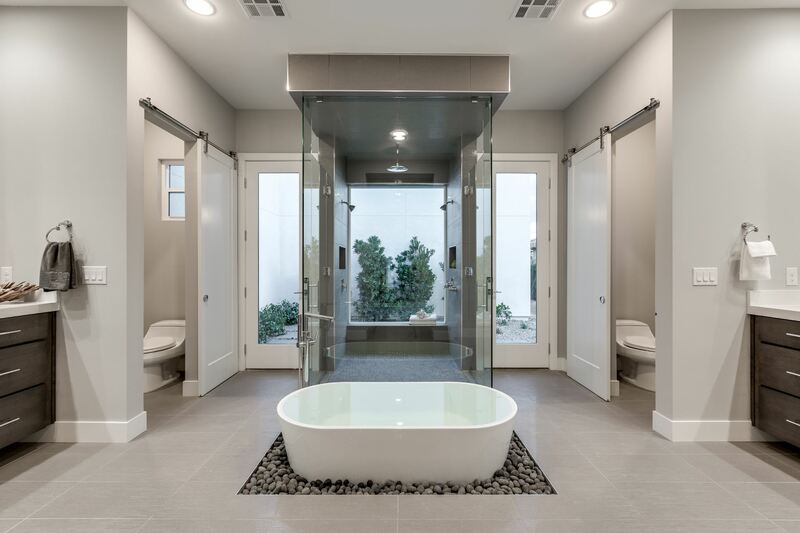 Sometimes the best things are found in unexpected places. 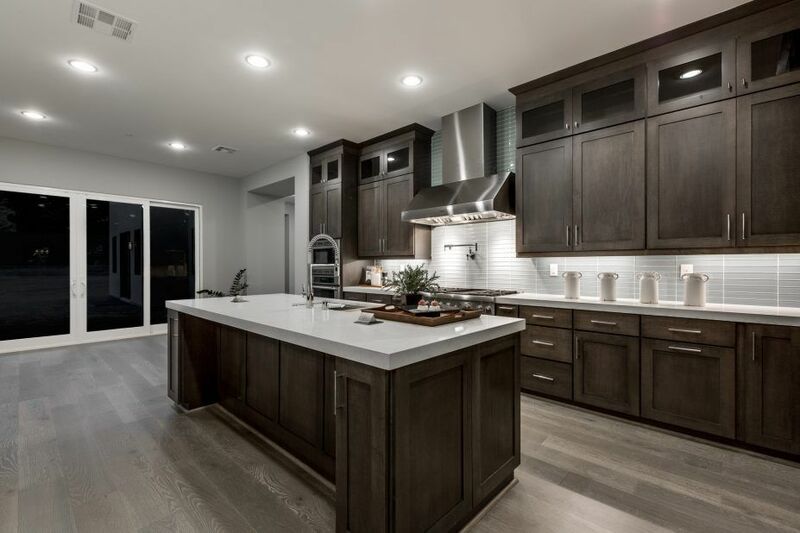 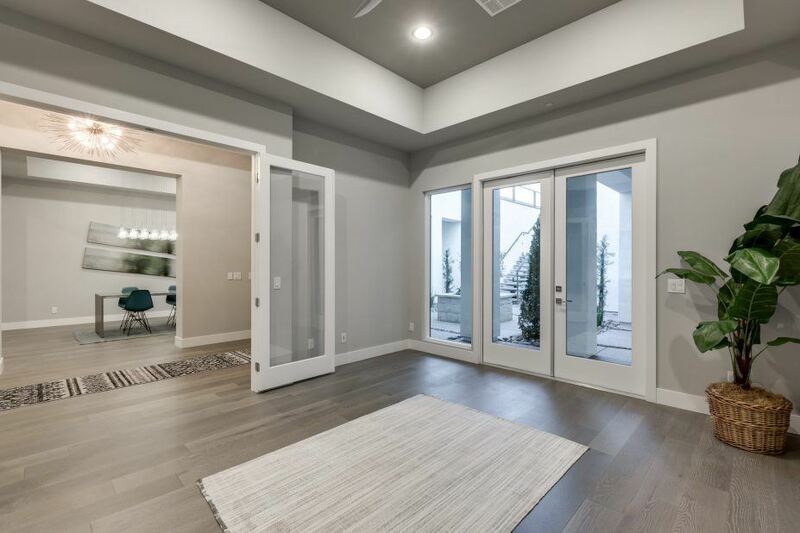 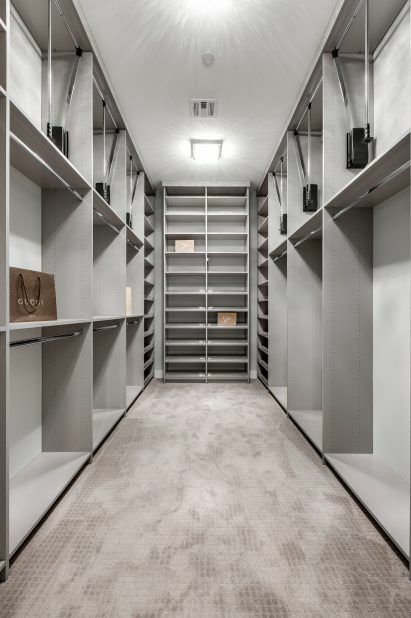 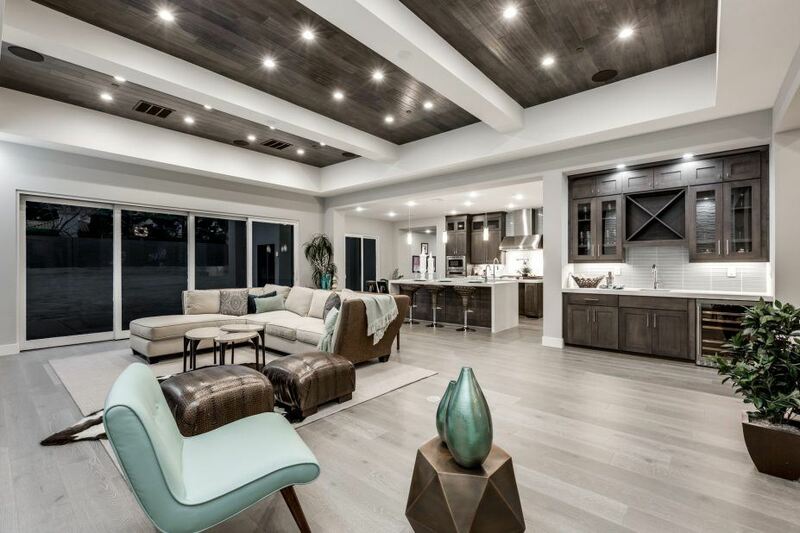 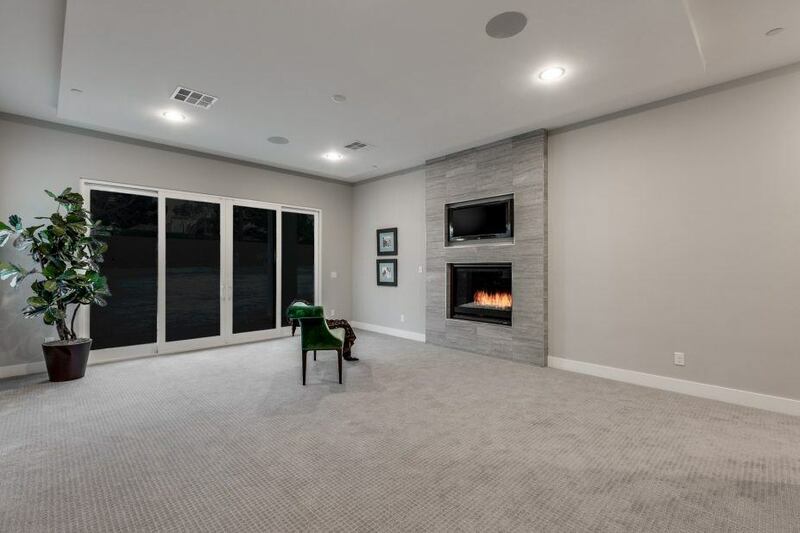 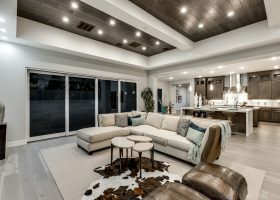 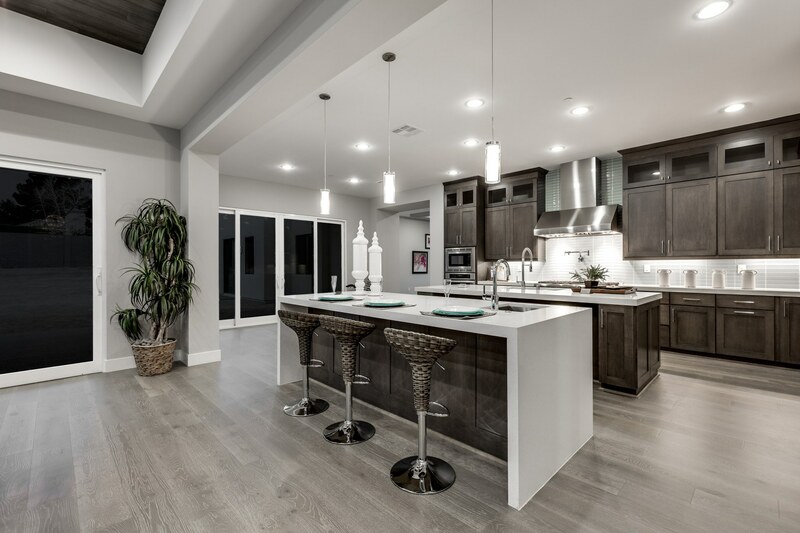 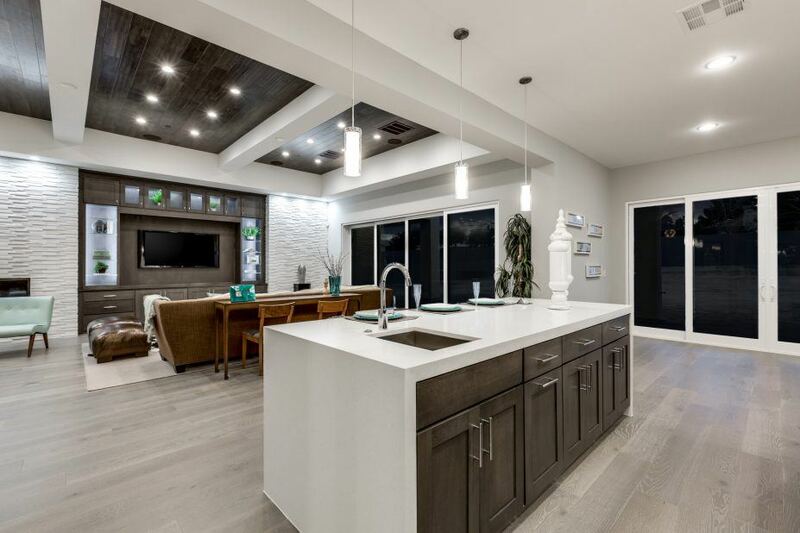 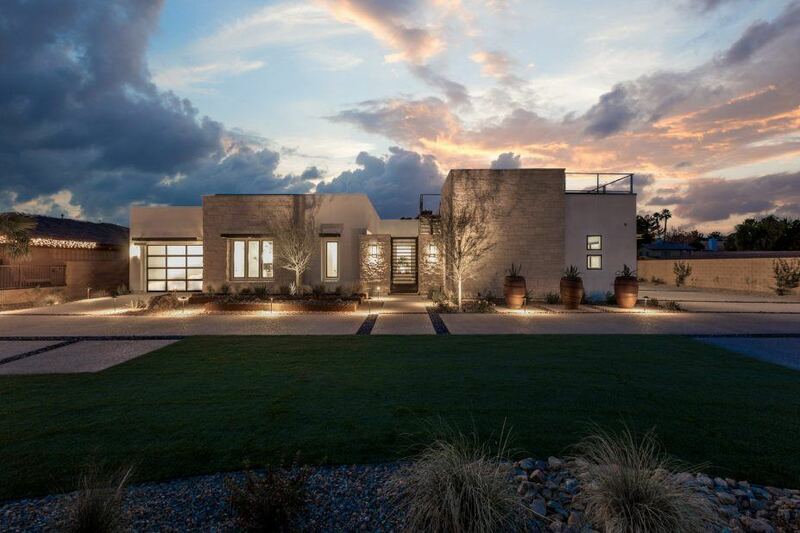 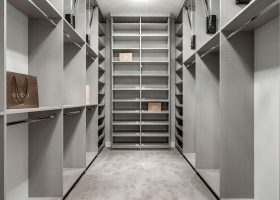 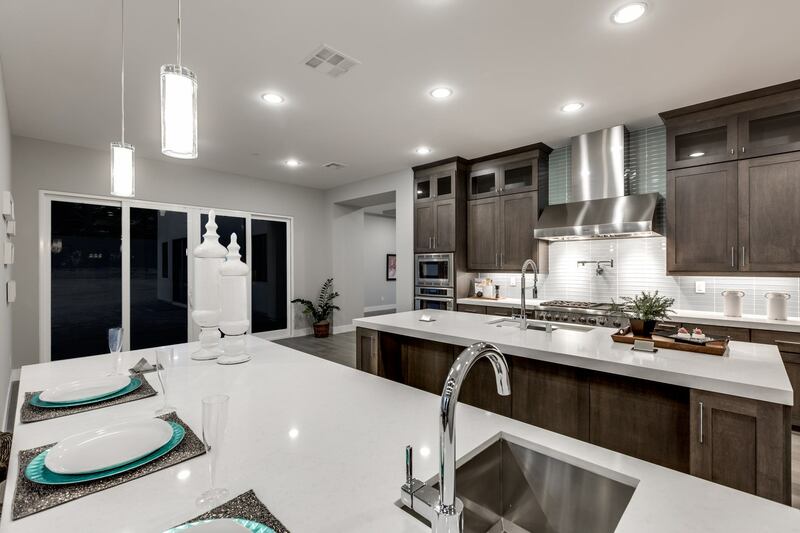 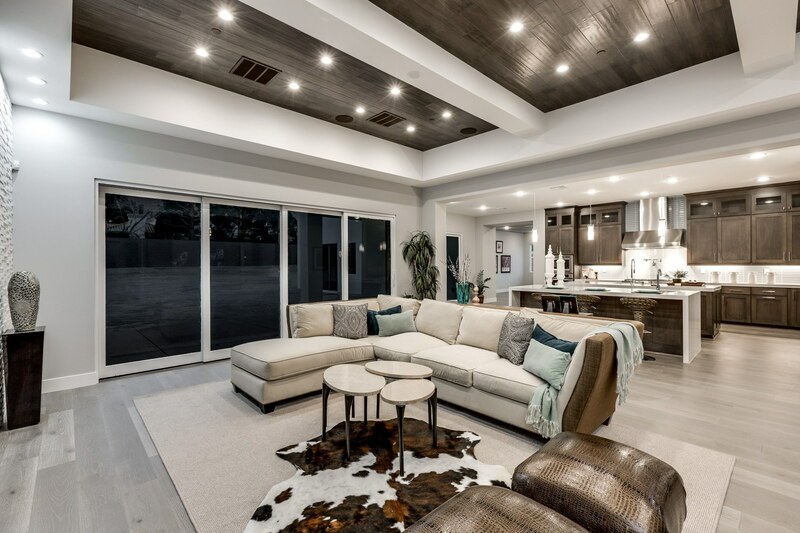 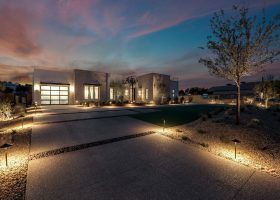 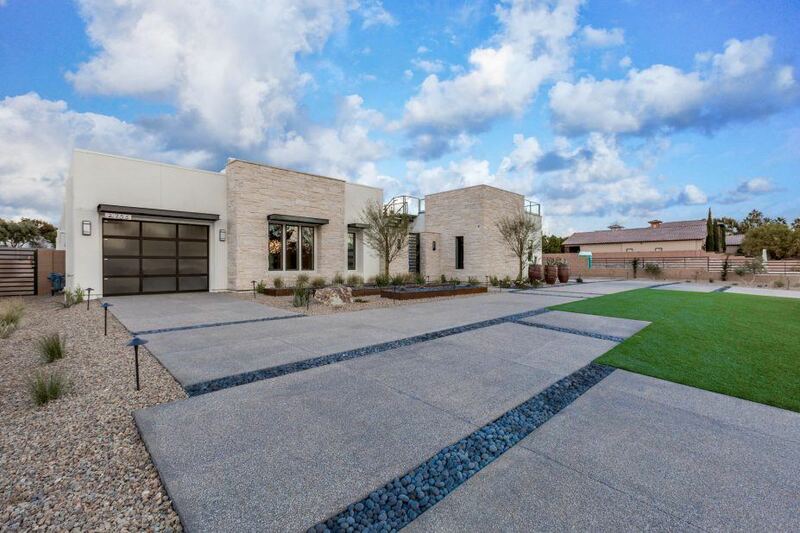 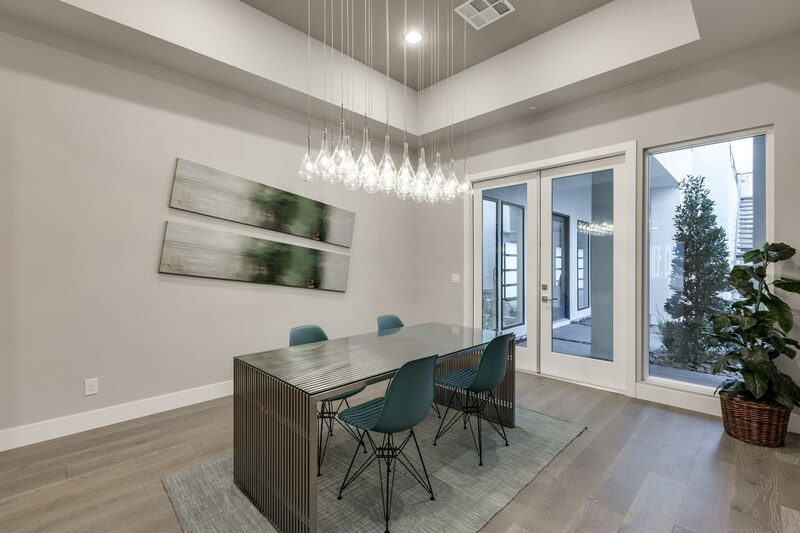 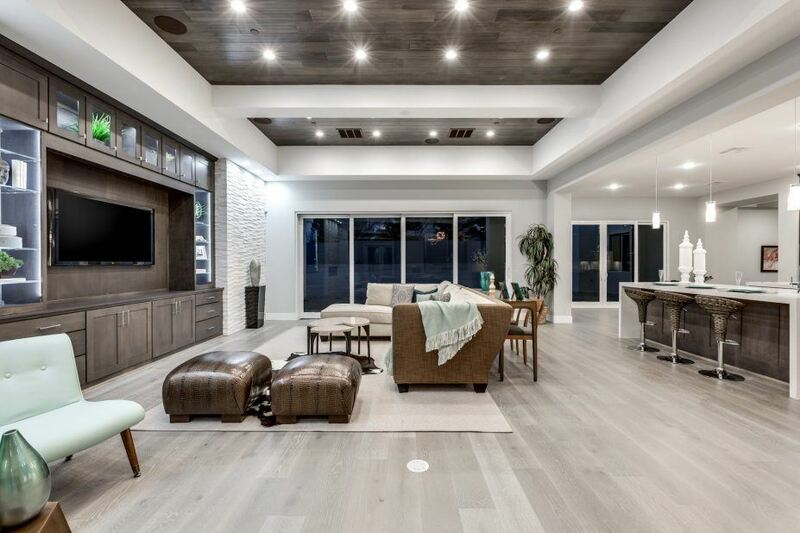 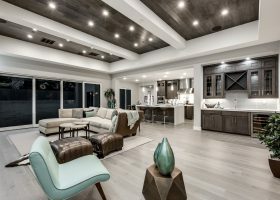 This 7,067 square foot property makes a powerful and striking impact on a quiet stretch of Tenaya Way, about six miles west of the Las Vegas Strip. 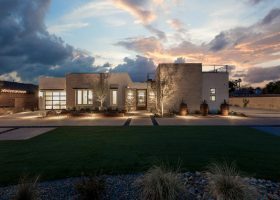 With a sleek and modern design, the spacious estate sits on about three-quarters of an acre, providing plenty of room and flexibility for additions behind the residence. 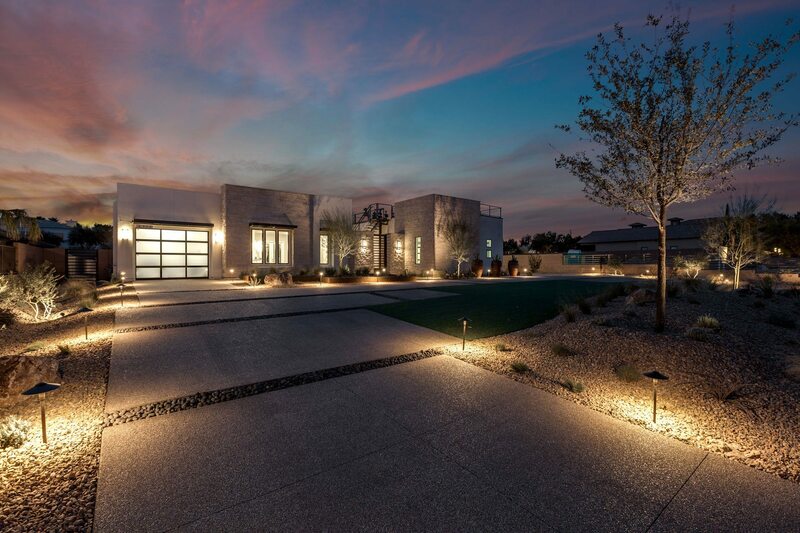 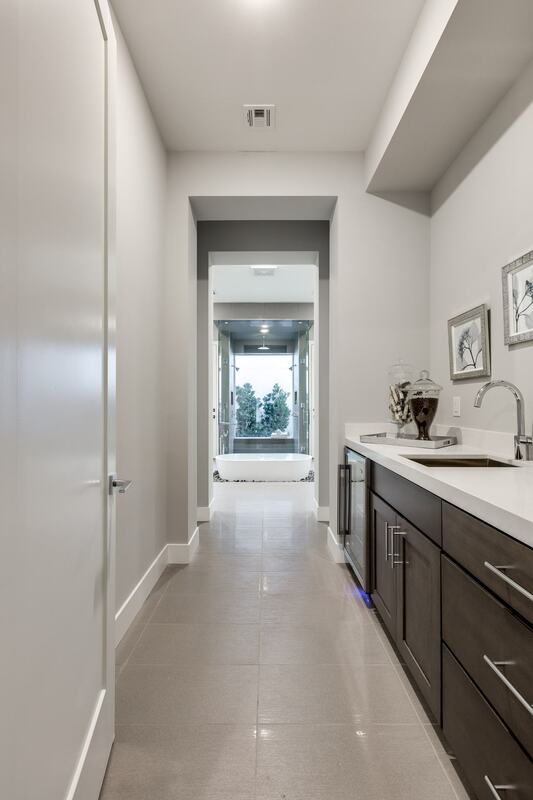 Some of the home’s most distinctive features are unmistakable from the street. Rows of lava rocks accentuate the desert landscaping that leads to the house from the driveway. 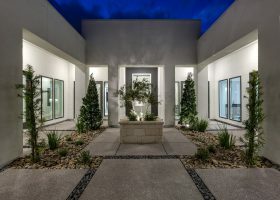 Just past the front entrance, a courtyard staircase climbs to a vast 880 square foot rooftop deck with a tabletop fireplace and 360-degree views of Las Vegas. 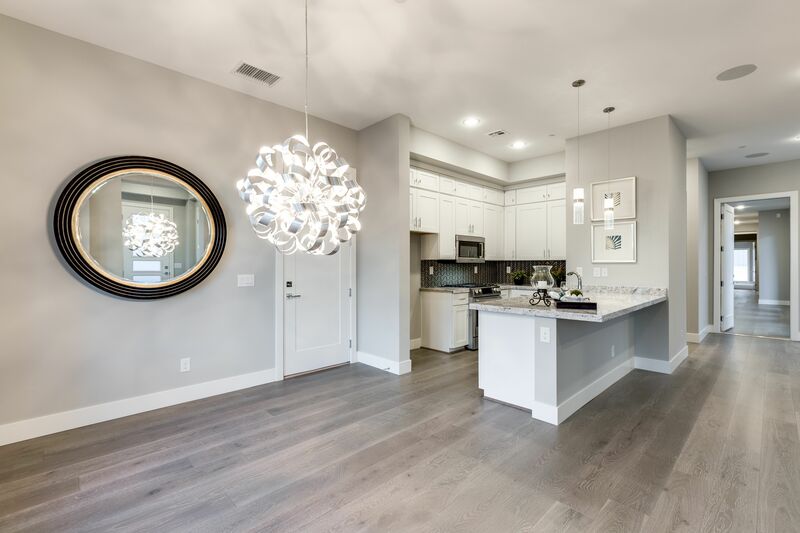 It’s a spot any homeowner would relish for entertaining guests. 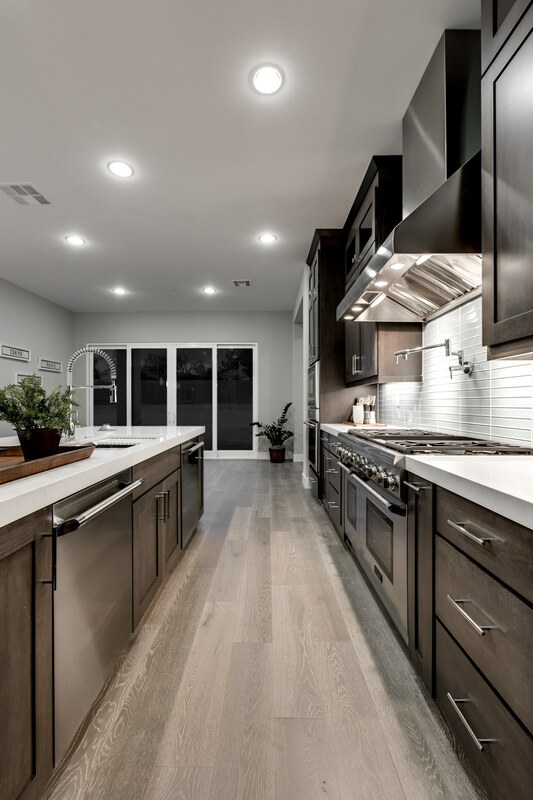 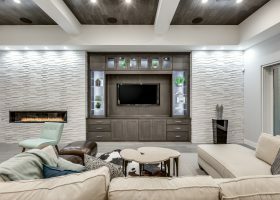 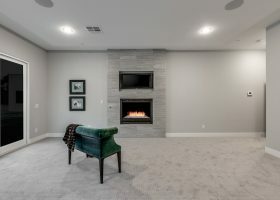 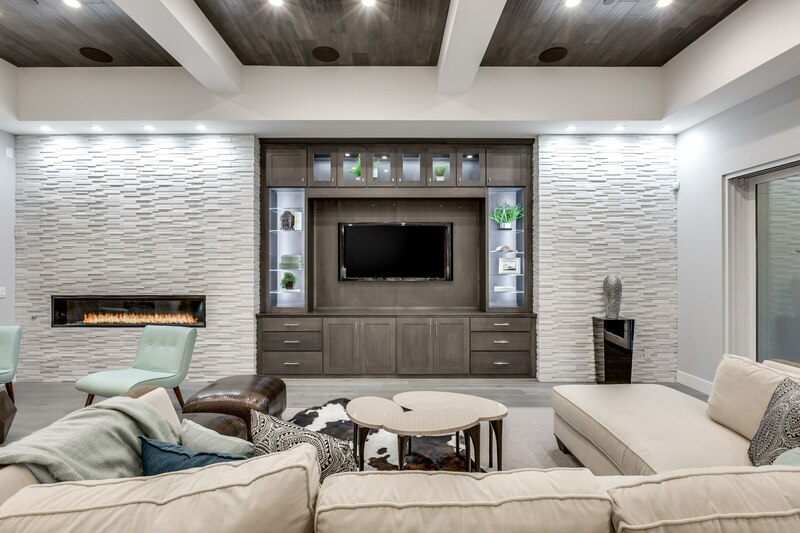 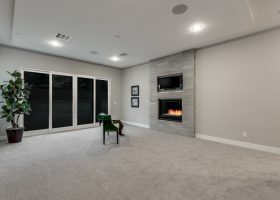 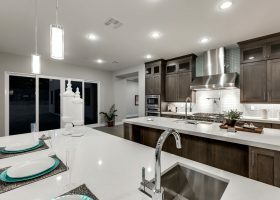 The modern design of the home continues indoors, where contemporary furnishings include horizontal fireplaces, a built-in entertainment system and elaborate lighting fixtures that hang from the ceiling. 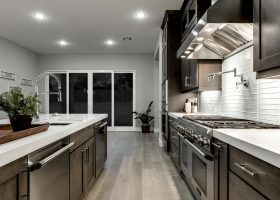 You won’t see the same one twice. The cutting-edge style is especially strong in the master bedroom, featuring a sleek fireplace and side door that spills out onto the covered backyard patio. 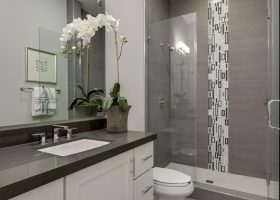 It’s augmented by an indulgent ensuite bathroom, with a large rectangular shower serving as the centerpiece, containing multiple showerheads and an entrance on each side. 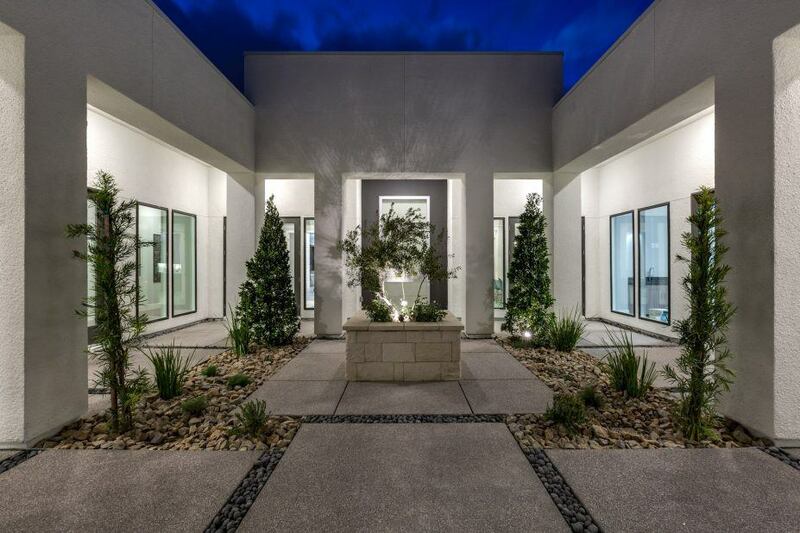 The back lines up with the wall as a floor-to-ceiling window, gazing out to the courtyard. 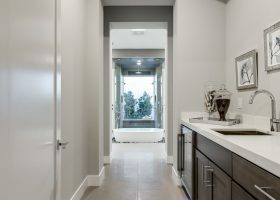 If you’re a bit shy, don’t worry. With a flip of the switch, the glass can be electronically frosted for privacy. 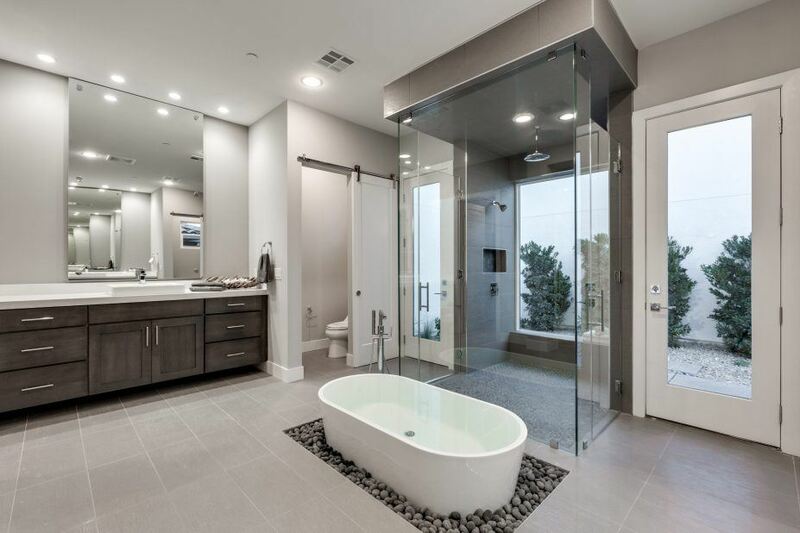 Otherwise, soak yourself in an infinity bathtub where water continuously spills over the side onto the rocks that surround it. 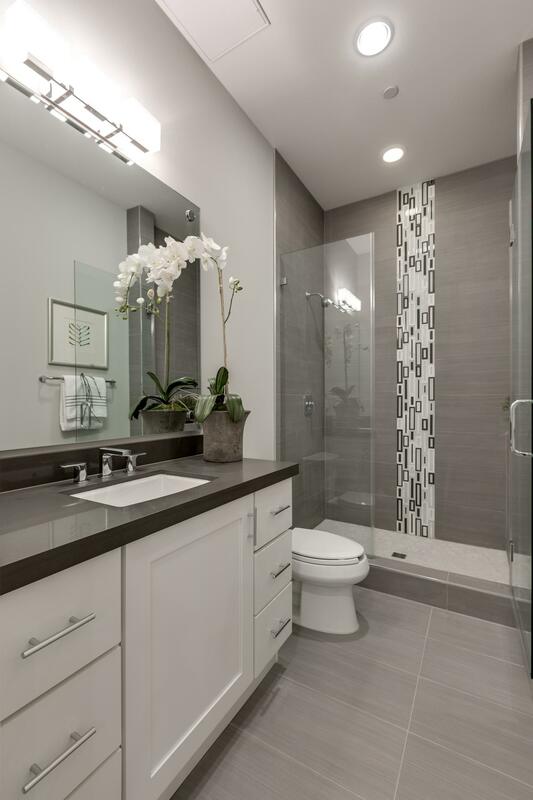 The bathroom is framed by separate sinks and closets that allow couples some individual space to call their own. 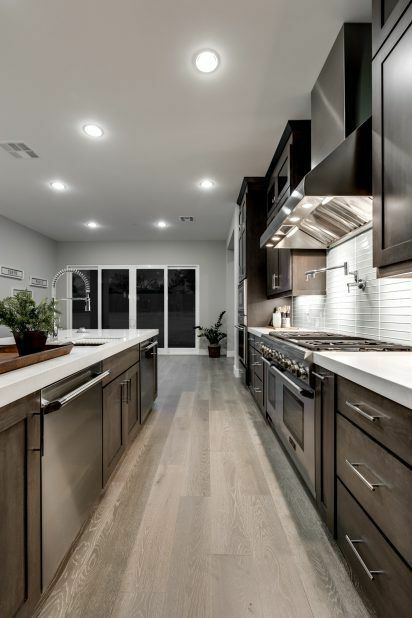 The interior of the home opens up wide, passing under tall ceilings, through a modern gourmet kitchen, past a spacious office and around a laundry area that’s the size of a small apartment. 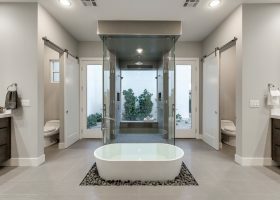 Five other bedrooms all have their own bathrooms. 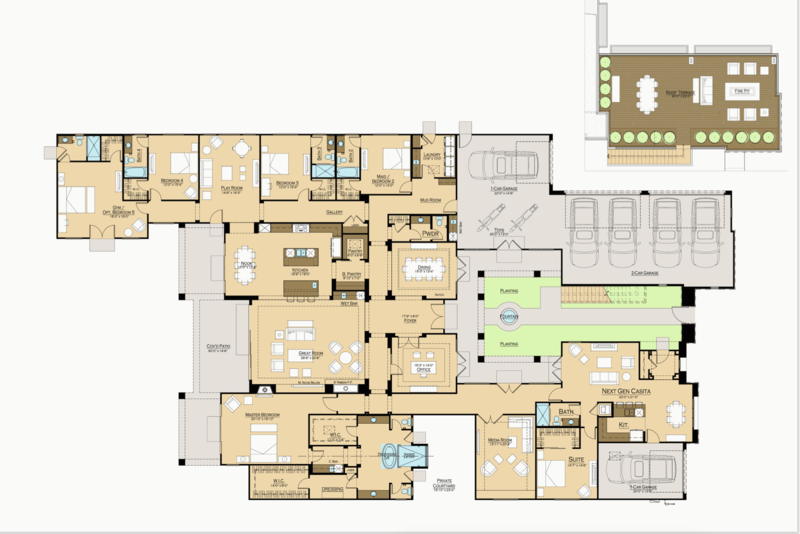 The parking garage includes a corner-turn and enough space for six vehicles. 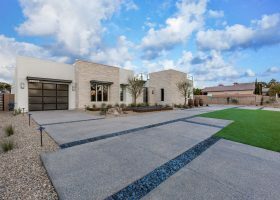 The expansive backyard remains unfinished by design, serving as a blank canvas with plenty of room for a full regulation basketball court, Olympic-size swimming pool, additional structures or whatever the homeowner desires. 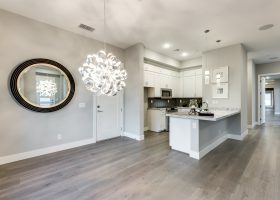 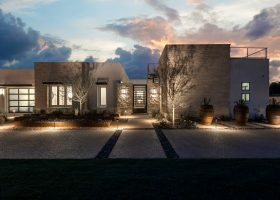 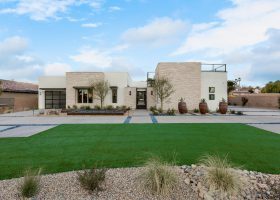 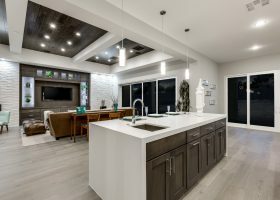 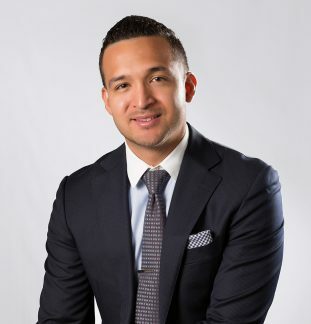 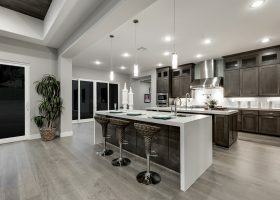 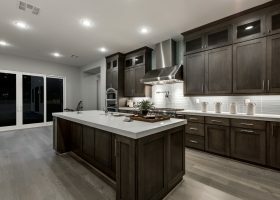 The estate also boasts a home-within-a-home concept with a casita that is actually attached to the house, connected by a hallway that can be locked for privacy. 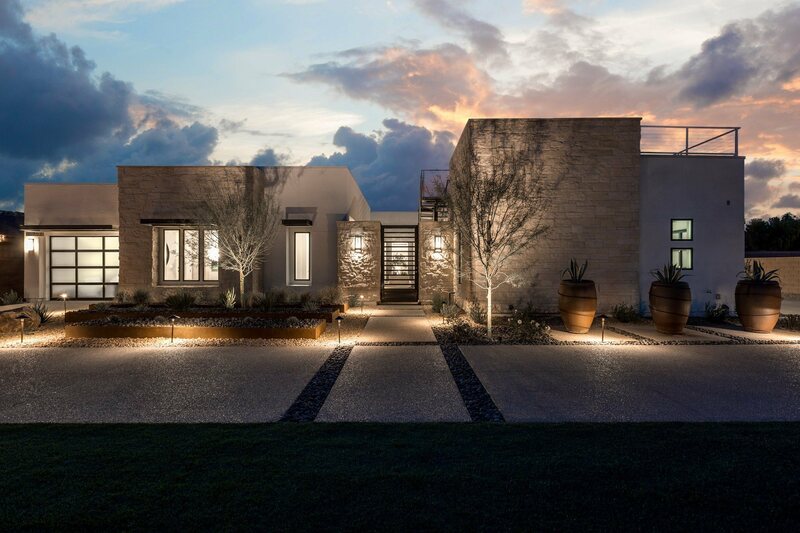 The indulgent guest quarters come with a kitchen, laundry and single-car garage. 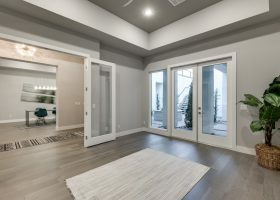 The home is brand new (constructed in 2016) and framed by two other distinctly different but similarly valued estates from the same contractor. 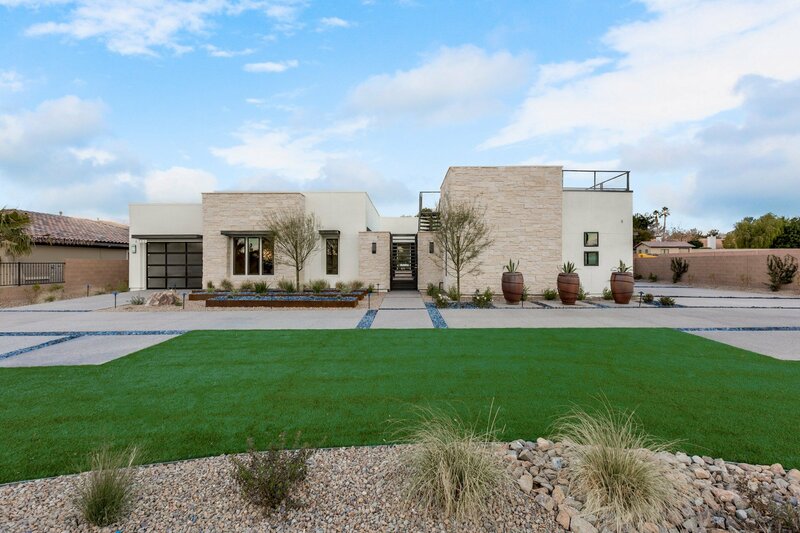 All three complement each other, adding character, identity and value to this charming Section 10 neighborhood.